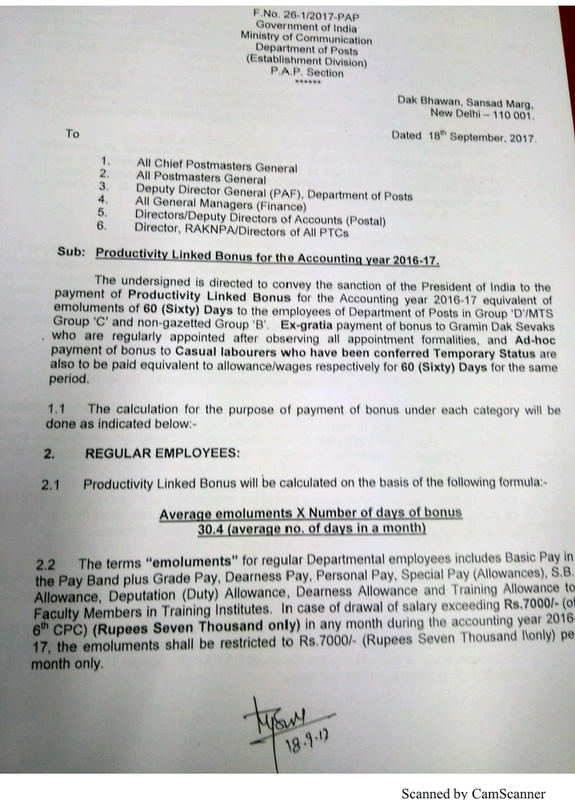 Productivity Linked Bonus(PLB) for the accounting Year 2016-2017 : Department of Posts. Subject:- Procedure for empanelment of retired officers as the Inquiry Officers for conducting Departmental Inquiries- reg. 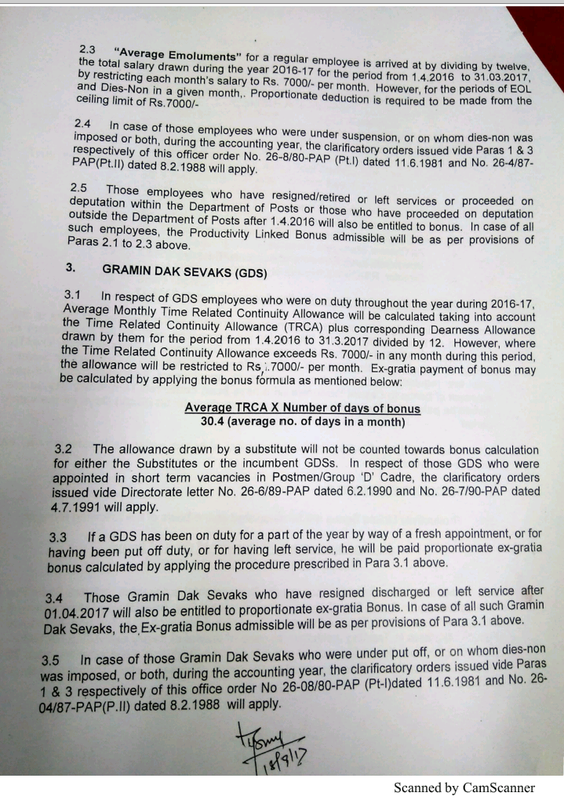 The undersigned is directed to state that the issue of utilizing the services of retired officers for conducting departmental inquiries had been under consideration of the Department. It has now been decided that panels of retired officers from the Ministries/Departments under Government of India and PSUs would be created and maintained by the respective Cadre Controlling Authorities for conducting Departmental Inquiries against the delinquent officials. 2. Procedure for empanelment of retired officers as the Inquiry Officers - Panels of retired officers not below the rank of Deputy Secretary in Central Government and equivalent officer in the State Governments/PSUs to be appointed as the Inquiry Officer for the purpose of conducting departmental inquiries would be maintained level/rank wise and place-specific by each cadre controlling authority where its offices are located. 3. Validity of the panel - The panel of the retired officers created for the purpose of appointing Inquiry Officers for conducting departmental inquiry will be valid for a period of three years. The respective Cadre Controlling Authority will ensure that a panel of retired Inquiry Officers is available with them. 5. The respective Cadre Controlling Authority will immediately take necessary action for inviting applications from willing and eligible retired officers to serve as the Inquiry Officer for conducting departmental inquiry. In this regard, a format for inviting applications is annexed. 6. A three-member committee consisting of Joint Secretary level officers including CVO of the concerned Ministry/Departments/PSUs would be constituted by the respective cadre controlling authority. The other two members can be from the same Ministry/Department or from the attached or subordinate office. After receipt of willingness of the retired officers, names of the officers will be screened by the committee so constituted. The formation of panel will be a continuous and ongoing process. The DA will decide on the appointment of the JO based on willingness for a case, experience in the sector and status of residence. Committee constituted for making panels of retired officers as the Inquiry Officer has to keep in mind that applications of retired officers willing to serve as an Inquiry Officer should be scrutinized carefully to ensure that the applicant meets the eligibility criteria. 7. The number of disciplinary cases assigned to an Inquiry Officer may be restricted to 8 cases in a year, with not more than 4 cases at a time. (ii) shall maintain strict secrecy in relation to the documents he/she receives or information/data collected by him/her in connection with the inquiry and utilize the same only for the purpose of inquiry in the case entrusted to him/her. 9. No such documents/information or data shall be divulged to anyone during the Inquiry or after presentation of the Inquiry Report. All the records, reports etc. available with the Inquiry Officer shall be duly returned to the authority which appointed him/her as such, at the time of presentation of the Inquiry Report. 11. The Inquiry Officer shall undertake travel for conducting inquiry (in unavoidable circumstances) with the approval of an authority as may be nominated by the concerned Ministry/Department. 12. The Inquiry Officer shall submit the inquiry report after completing the inquiry within 180 days from the date of his/her appointment as the Inquiry Officer. Extension of time beyond 180 days can be granted only by the Authority as may be prescribed. 50% will be paid on submission of the Inquiry Report. Remaining amount will be paid within 45 days. 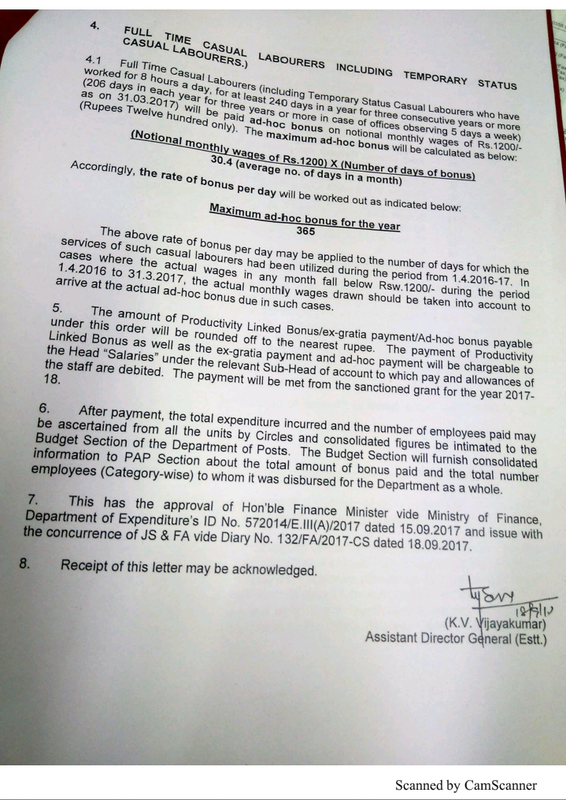 In case it is not possible to proceed with the matter due to stay by courts etc., the Inquiry Officer may be discharged from his/her duties and payment of honorarium and other allowances will be made on pro rata basis. (a) All case records and inquiry report (two ink signed copies) properly documented and arranged is handed over to the office of Disciplinary Authority. (b) The report returns findings on each of the Articles of Charge which has been enquired into should specifically deal and address each of the procedural objections, if any, raised by the charged officers as per the extant rules and instructions. (c) There should not be any ambiguity in the inquiry report and therefore every care should be taken to ensure that all procedures for conducting departmental inquiries have been followed in accordance with the relevant rules/instructions of disciplinary and appeal Rules to which the delinquent Government officials are governed. 15. Letter regarding engaging a retired officer as the Inquiry Officer will only be issued with the approval of the Disciplinary Authority of the Ministry/Department/ Office concerned. 16. A review of every empanelled Inquiry Officer will be done after receipt of 2 inquiry reports where adherence to time lines and the procedure and quality of work will be assessed by the concerned Ministry. Subsequent allocation of work may be done only after such evaluation. The services of Inquiry Officers whose performance is not upto the mark will be terminated with the approval of appointing authority. 17. Any issue arising out of this O.M. between the Inquiring Officer and the Disciplinary Authority will be decided by the Secretary , DoPT whose decision shall be final and binding on both parties. 18. These guidelines are issued for internal use of DoPT and other Cadre controlling authorities may adopt the same with suitable amendments.